A Boeing 727, operating PSA flight 182 and a Cessna 172 crashed in a residential area of San Diego, California, following a mid-air collision. All 135 on board the Boeing 727, both occupants of the Cessna and seven persons on the ground were killed. visual meteorological conditions, no flight plan was filed and none was required. A flight instructor occupied the right seat, and another certificated pilot, who was receiving instrument training, occupied the left seat. The Cessna proceeded to Lindbergh Field, where two practice ILS approaches to runway 9 were flown. Although the reported wind was calm, runway 27 was the active runway at Lindbergh. About 08:57, N7711G ended a second approach and began a climbout to the northeast; at 08:59:01, the Lindbergh tower local controller cleared the Cessna pilot to maintain VFR conditions and to contact San Diego approach control. At 08:59:50, the Cessna pilot contacted San Diego approach control and stated that he was at 1,500 ft and "northeastbound." The approach controller told him that he was in radar contact and instructed him to maintain VFR conditions at or below 3,500 ft and to fly a heading of 070°. The Cessna pilot acknowledged and repeated the controller's instruction. Pacific Southwest Airlines Flight 182 was a regularly scheduled passenger flight between Sacramento and San Diego, California, with an intermediate stop at Los Angeles, California. The flight departed Los Angeles at 08:34 on an IFR flight plan with 128 passengers and a crew of 7 on board. The first officer was flying the aircraft. A deadheading company pilot occupied the forward observer seat in the cockpit. At 08:53:19, Flight 182 reported to San Diego approach control at 11,000 ft and was cleared to descend to 7,000 ft. At 08:57, Flight 182 reported that it was leaving 9,500 ft for 7,000 ft and that the airport was in sight. The approach controller cleared the flight for a visual approach to runway 27; Flight 182 acknowledged and repeated the approach clearance. At 08:59:28, the approach controller advised Flight 182 that there was "traffic (at) twelve o'clock, one mile, northbound." Five seconds later the flight answered, "We're looking." At 08:59:39, the approach controller advised Flight 182, "Additional traffic's twelve o'clock, three miles, just north of the field, northeastbound, a Cessna one seventy-two climbing VFR out of one thousand four hundred." At 08:59:50, the copilot responded, "Okay, we've got that other twelve." At 09:00:15, about 15 sec after instructing the Cessna pilot to maintain VFR at or below 3,500 ft and to fly 070°, the approach controller advised Flight 182 that "traffic's at twelve o'clock, three miles, out of one thousand seven hundred." At 09:00:21, the first officer said, "Got em", and 1 sec later the captain informed the controller, "Traffic in sight." At 09:00:23, the approach controller cleared Flight 182 to "maintain visual separation," and to contact Lindbergh tower. At 09:00:28 Flight 182 answered, "Okay," and 3 sec later the approach controller advised the Cessna pilot that there was "traffic at six o'clock, two miles, eastbound; a PSA jet inbound to Lindbergh, out of three thousand two hundred, has you in sight. "The Cessna pilot acknowledged, "One one golf, roger." At 09:00:34, Flight 182 reported to Lindbergh tower that they were on the downwind leg for landing. The tower acknowledged the transmission and informed Flight 182 that there was "traffic, twelve o'clock, one mile, a Cessna." passing off to our right." The local controller acknowledged the transmission. Flight 182's flight crew continued to discuss the location of the traffic. At 09:00:52, the captain said, "He was right over there a minute ago." The first officer answered, "Yeah." At 09:01:11, after the captain told the local controller how far they were going to extend their downwind leg, the first officer asked, "Are we clear of that Cessna?" The flight engineer said, "Suppose to be"; the captain said, "I guess"; and the forward jumpseat occupant said, "I hope." At 09:01:21, the captain said "Oh yeah, before we turned downwind, I saw him about one o'clock, probably behind us now." At 09:01:31, the first officer called, "Gear down." At 09:01:38, the first officer said , "There's one underneath," and then, 1 sec. later, he said, "I was looking at that inbound there." At 09:01:28, the conflict alert warning began in the San Diego Approach Control Facility, indicating to the controllers that the predicted flightpaths of Flight 182 and the Cessna would enter the computer's prescribed warning parameters. At 09:01:47, the approach controller advised the Cessna pilot of "traffic in your vicinity, a PSA jet has you in sight, he's descending for Lindbergh." The transmission was not acknowledged. The approach controller did not inform Lindbergh tower of the conflict alert involving Flight 182 and the Cessna, because he believed Flight 182's flightcrew had the Cessna in sight. The aircraft collided at 09:01:47. Flight 182 was descending and overtaking the Cessna, which was climbing in a wing level attitude. Just before impact, Flight 182 banked to the right slightly, and the Cessna pitched noseup and collided with the right wing of Flight 182. The Cessna broke up immediately and exploded. Segments of fragmented wreckage fell from the right wing and empennage of Flight 182. Flight 182 began a shallow right descending turn, leaving a trail of vaporlike substance from the right wing. A bright orange fire erupted in the vicinity of the right wing and increased in intensity as the aircraft descended. The aircraft remained in a right turn, and both the bank and pitch angles increased during the descent to about 50° at impact. PROBABLE CAUSE: "The failure of the flightcrew of Flight 182 to comply with the provisions of a maintain-visual-separation clearance, including the requirement to inform the controller when visual contact was lost; and the air traffic control procedures in effect which authorized the controllers to use visual separation procedures in a terminal area environment when the capability was available to provide either lateral or vertical separation to either aircraft. 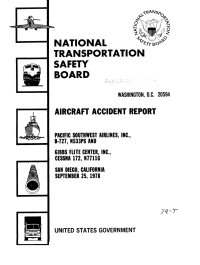 Contributing to the accident were (1) the failure of the controller to advise Flight 182 of the direction of movement of the Cessna; (2) the failure of the pilot of the Cessna to maintain his assigned heading; and (3) the improper resolution by the controller of the conflict alert." Distance from Los Angeles International Airport, CA to San Diego International Airport, CA as the crow flies is 175 km (109 miles).